I wish I had all the guts in the world to hug our dearest mommy mentor a while ago (I sure bet Ariane and Kaymee would have wanted that too). I never felt so enlightened, and comforted. Had a great time sharing thesis experiences, the heaven and hell of research and gathering of all pertinent data, the RRL, the RQ (which we have totally forgotten). The kids basically asked how we came up with the topic and how we got to know our subjects. (Yes, they were shocked when we told them that originally, our topic was about Harry Potter and Hogwarts Philippines). They were pretty amused by how we ended up shooting in different far flung places. Well, that's research, hahha! We have so much things to tell but we ran out of time. It felt so good to hear the younger generations asking questions that we once upon a time asked to the older batches.... and of course it's always heart-warming to hear Dr. Diaz talk about her mentoring us and what we went through. She was very giddy. Then came the highlight of this one happy day. 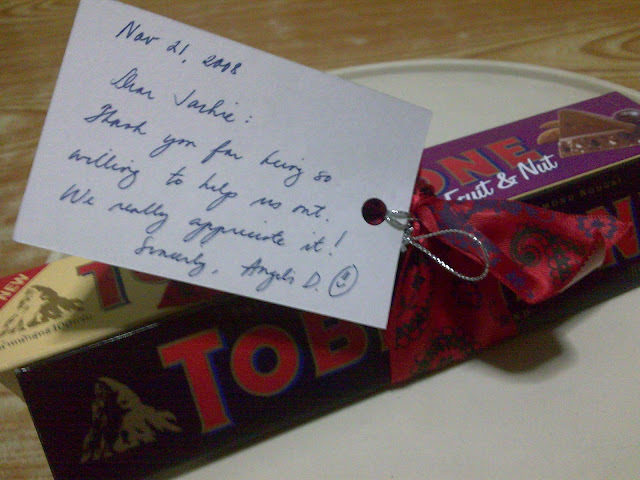 She asked us to stay and brought us bars of Toblerone as token. She was beaming with pride when she said that she placed the ribbons all by herself and personalized it with the cards. Awwww it made my heart melt. We talked about where we are right now and all our frustrations went on high. And since she's the best mentor in the whole wide world, together with Ms. Mel, who would have thought she'd mentor us even after we have graduated? Talk about love! hehehe! At the end of the day, it's always nice to go back to school and just sit outside the Commdept hallway. But you won't no longer talk about your thesis, or your mentor, or your consultation schedule... you'd sit and talk about how you miss school, your professors, and just the idea of hanging out and being with the company of great people. One happy day worth my half-day leave, and Ariane's absence, and Kaymee's 'sick leave'.